Thanks for sharing this interview!! 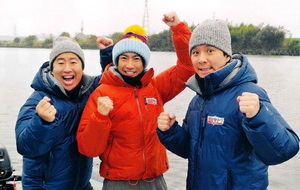 Thinking back to the Mago Mago Arashi days, I believe that those experiences have really helped Aiba-kun in making connections with the locals and taking on surprising and laborious tasks. I agree with you in that Aiba Manabu is my favorite solo show. He strikes a wonderful balance of genuineness and professionalism.